Whether it’s to save money or try something new, a staycation can be just as relaxing as the beach or as exciting and even life-changing as a trip to an exotic locale. Are you looking to feel relaxed and recharged? Planning a staycation? First, consider the goal of the time off. Are you looking to feel relaxed and recharged? Or maybe you’re craving reconnection with a partner. It could be that you want to feel more grounded or to finally learn the basics about wine, or art, or anything that interests you. Once you know the goal of your time off, plan an itinerary. Here are some ideas. Plan to watch some comedies or uplifting flicks at the local theatre or on Netflix. Have some “beach reads” at the ready. Enjoy a massage, easy yoga class or tai chi. 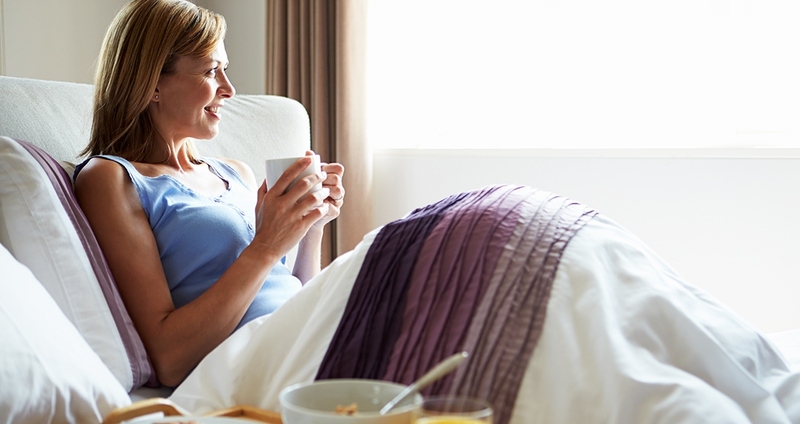 Indulge in sleeping in and napping—have breakfast in bed! Dine on splurge foods. Hit some of your favorite restaurants or cook at home if that’s relaxing. Plan some private or group tours at your local museums. Consider reading up on the subjects beforehand. Learn a new language by hiring a teacher to jump-start your skills with a week-long intensive. Make it fun with outings while speaking in your new language. Do a lesson in a subject of interest each day. For example, want to learn about Buddhism? Have a lesson plan for each day (maybe reading and documentaries) and time to meditate. Visit the Asian arts section of your local art museum. Take turns giving each other full-body massages. Cook lavish dinners at home and dine by candlelight. Arrange a special day for one another. Read to each other—this can be poetry, fiction, whatever you want. Schedule a private couple’s yoga or tai chi class. Spend a lot of time in the bedroom. Commit to meditating and journaling each day. Awake early every morning and go to bed early. Abstain from alcohol, caffeine and junk food. Plan a session or two with a life coach, shaman or other spiritual practitioner. Indulge in a private yoga class. Walk, run or swim in nature each day. Decide how you will limit electronic usage. Maybe vow to check e-mails and messages once a day only—or not at all. Clean and organize the house before your vacation starts. Stock the fridge with any food you will be eating. Inform everyone that you will be unavailable. Hold your mail for the week. Whether you need a little R and R or simply want to reconnect with a loved one, a staycation can be just as enjoyable and effective as a trip out of town. Take the time to plan it well and enjoy the extra energy you gain by skipping the travel portion of vacationing. Bon voyage!